If you listen to classic American radio programs long enough, you get used to certain voices. Not necessarily big star voices, not the actors you recognize because they get their names at the top of the credits, but the other voices - the unheralded character actors who gave radio such a rich vocal texture. Some of those performers stand out. Some of them became so ubiquitous that it seemed the rare radio program that didn't include them in some capacity or other. And at the top of an imaginary list of those performers, you'd find the name of Joseph Kearns. He's best remembered to Baby Boomer television viewers as George Wilson: the fussy, sour-pickle antagonist of transplanted comic-panel moppet "Dennis The Menace." But as memorable as Mr. Wilson was to the generation that snickered at his slow-burn frustrations on TV, he was only the finale to Joseph Kearns' long and varied career, a career that found him as much in demand for serious drama as for situation comedy. Radio's Outstanding Theatre of Thrills seldom stayed in one place for long. 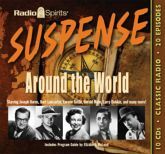 Over the course of its twenty-year run, Suspense presented stories that spanned the entire earth. From the four corners of the globe come tales of shock and tension! Distant lands, exotic settings, and the mystery of the Unknown all converge to bring you outstanding tales of...Suspense! This wonderful compilation features performances by Burt Lancaster, Joseph Cotton, Merle Oberon, Richard Widmark, Brian Donlevy, Berry Kroeger, Joseph Kearns, Lurene Tuttle, Cathy Lewis, Gerald Mohr, Larry Dobkin, and more in 20 digitally remastered episodes. The idea was that once young Joseph Kearns had gotten all the youthful wool-gathering out of his system, he would join his father in serious, grown-up wool gathering. The elder Kearns was a western buyer for a Boston-based woolen company, dealing with sheep farmers and shipping raw fleece back east for processing. After graduating from the University of Utah with a degree in music, the idea of spending his life in such a business did not fill young Joe with a throbbing sense of expectation. To please his father, he took a job with the firm and tried to make the best of it. During this time he took side jobs as a motion-picture organist, developing an enduring love for the beauty and majesty of the theatre organ. The instrument possessed his soul in a way that no boxcar full of wool ever could. Joseph Kearns might not have had an enduring passion for the wool-buying game, but he thought he'd hit the jackpot when he bought $8,000 worth of exotic fleece and shipped the load back to the head office -- only to be told that the firm had no use for undyeable black wool. With that gaffe on his permanent record, Joseph Kearns took his leave from the wool business, a decision with which his father heartily agreed, and signed on with a California theatrical company instead. That was the beginning of Kearns' career as an actor. Like all stock-company performers, he played whatever role came his way, learning the ways of the stage from the footlights up. He toured with roadshow versions of the popular plays of the day, he rubbed shoulders with the occasional big star on his way up (among them a shambling, big-eared kid named Gable who passed through the company on his way to better things), and learned how to use his distinctive voice to its best advantage. He was never a handsome leading-man type -- but handsome leading men have always been a dime a dozen. Kearns learned early on that what keeps a play going, what makes a show a success, are the character actors who give it texture and life. With a voice like his, it was only natural that radio would eventually beckon. As radio drama crawled out of its infancy and learned to walk, actors like Joseph Kearns became its lifeblood -- young, eager to work, and cheap to hire. He jobbed his way through the early thirties, finding his way to Los Angeles, where he joined the KHJ stock company under actor-director Lindsay MacHarrie. Like most of his colleagues, he engaged in extensive moonlighting around the various transcription studios that, with the Depression-era syndication boom, were cropping up around Hollywood like mushrooms after a summer rain. MacHarrie became production director at the Radio Transcription Company of America, better known as Transco, and Kearns was one of many KHJ veterans to turn up in the many low-budget platter serials churned out by this firm through the mid-1930s. But Joseph Kearns' real bread and butter became network radio, as the mid-thirties saw the Hollywoodization of radio drama. At first in a trickle, and then in a rush, big-time programs shifted from New York and Chicago to the film capital. Kearns quickly established himself as one of the favorites in the Hollywood radio directory, turning up again and again in such major series as Lux Radio Theatre and Hollywood Hotel. He also became a favorite in newly-transplanted comedy programs, where he competed with Hanley Stafford and Gale Gordon for the seemingly-endless parade of stuffy, short-tempered authority figures encountered by all the comedians of the day. The forties were the flood tide of Joseph Kearns' radio career. He became "The Man In Black," forbidding host of the legendary thrill anthology Suspense -- although his teetotaling Mormon beliefs made him flinch every time he mentioned sponsor Roma Wine. He also became Ed the Guard, the subterranean sentinel of Jack Benny's infamous vault. When Amos and Andy switched from their nightly serial format to a weekly situation comedy in 1943, Kearns became a regular member of their supporting stock company, appearing in a wide variety of gruff authority-figure roles. He became a regular antagonist for Mel Blanc, when that Benny-show colleague gained his own program, and he played multiple parts opposite hayseed comedienne Judy Canova. He appeared again and again on all the Hollywood dramatic anthologies, from the Cavalcade of America to the Hallmark Hall of Fame, and even after his host role on Suspense was dropped, it was the rare episode of that series where he didn't play at least one character. 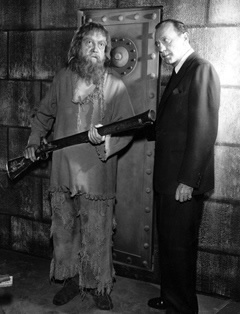 Kearns kept going into the fifties, a bedrock member of the CBS-Hollywood stock company, and his success allowed him to fulfill a longtime dream. CBS had purchased an enormous Wurlitzer theatre organ from Warner Brothers Pictures, intending to install it in the Columbia Square studios. But with the popularity of the smaller, less-expensive Hammond electric organ as a source for fill music, the network packed the instrument away. The gigantic white elephant was ultimately headed for the scrapyard. Kearns had never gotten over his youthful love for theatre organs, and when he realized the network wanted to get rid of the Wurlitzer, he made an immediate cash offer. Realizing that he had nowhere to put the instrument now that he owned it -- and being a lifelong bachelor with no spouse, domestic partner, or family to accommodate -- he decided to build a whole new house around the organ. The remarkable two-and-a-half-story, cube-shaped, heavily-soundproofed structure had the pipes built right into the walls. And the console was the dominant feature of the living room. There, Joseph Kearns enjoyed his off hours making those walls thunder as no Hollywood walls had ever thundered before. 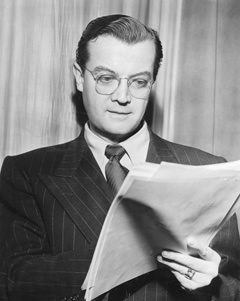 Joseph Kearns worked steadily in television as radio waned, as a favorite starched-shirt figure in situation comedies, culminating with his Dennis The Menace role in 1959. He was considering retirement by this stage in his life, and had initially signed on with the TV series only as a recurring character -- but, his antagonistic chemistry opposite child actor Jay North proved such that he fast became a regular. He continued in the role until his death from a sudden stroke in early 1962. He was only fifty-five years old. But he left a legacy. In addition to his long and impressive list of radio and television credits, Joseph Kearns left behind the true love of his life -- that mighty Wurlitzer organ. It had fallen into silence and disuse after its owner's death, but in 1985 the new owners of Kearns' home sold it to the Renaissance Theatre in Mansfield, Ohio, where it continues to impress and amaze film and concert audiences well into the twenty-first century with its remarkable, distinctive voice. For Joseph Kearns, there could be no better monument.